Some of the most notable architectural structures of the Mayan civilisation are temples. In most Mayan cities, the rich and the elite lived towards the centre of the city where a major temple was usually located. The temples were thus very significant in that their construction and support often substantiated the divine claim of the rulers of the city. Initial Mayan temples were built like huts but subsequent temples were sprawling structures made of stone and perched upon pyramids. Mayans dedicated much of their architectural prowess to the construction of religious monuments, including temples. Initial temples in the Mayan civilisation were simple but as the civilisation grew, large stone pyramids topped with shrines came to be identified as temples. Priests often managed over these temples and used them for sacrificial rituals as well as for other religious congregations. The pyramid-structure of the temples included staircases leading to the top. Staircases also carried religious significance. Mayan temples were typically located at the centre of the city, close to the palaces of the nobility and royalty. To elevate them above other structures in the neighbourhood, the temples were often built on top of mounds. Stones were used in conjunction with masonry and lime mixtures to prop up a solid building, which may explain why many of these temples have survived for more than a thousand years. In some temples, Mayans used repeated arches to increase the height of the ceiling. Most of the temples had staircases on one or more sides, which were ascended by the priests and the nobility and were considered an ascent which brought them closer to the gods. At the top of the pyramid structure usually sat shrines dedicated to different Mayan gods. Mayans offered sacrifices to their gods with the belief that these sacrifices would appease the gods. These sacrifices usually took place on the summit of the pyramid-temples. The victim was painted in sacrificial colours and conducted to the top of the temples. At the summit, priests and other relevant officials would get hold of the victim and lay him down on a special stone which thrust his chest slightly forward. Then a priest incised the victims breast and took out a still-beating heart. The heart was the tribute to the gods. The corpse of the body was flung down the stairs of the pyramid where attendants stood at the bottom to gather it. Knowledge of sciences such as astronomy and the use of hieroglyphic script was mostly limited to Mayan priests. These priests made use of this knowledge in the construction and ornamentation of the temples that were built. For instance, features related to astronomy are often found in the Mayan temple constructions. Notable among these is the El Castillo temple in Chitchen Itza which had such a structure that a serpent effect was created on its wall during equinoxes. Similarly, hieroglyphic inscriptions were often used on temple walls, detailing history, major events, sometimes even the names of the rulers and similar other details. On the doors and walls of the temples, gods and goddesses of the Mayan pantheon were also carved. This was especially done at the shrines located at the top of the temples, dedicated to specific gods. Typically, Mayan temples had two or four staircases, either on two opposite sides or on all four sides of the pyramid structure. Staircases were a powerful religious symbol for the Mayans. They signified the ascension of the humans from the Earth to the sky where the gods lived. In many cases, staircases were so steep that they could hardly be climbed. This was true for such temples where werent meant for sacrificial rituals and common Mayans were forbidden from climbing them. Mayans often considered astronomical movements and calculations when constructing their temples. This can be seen from the fact that many Mayan temples are aligned with the movement of one of the planets such as Venus, the sun or the moon. 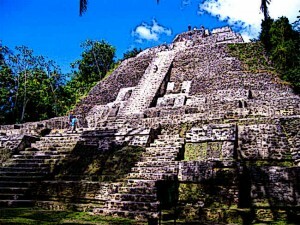 An example of this is the complex of pyramids at the Mayan city of Tikal. In front of the pyramid are situated three other temples. On equinoxes and solstices, the three temples can be seen aligned with the sun when viewed from the top of the temples. The serpent effect on El Castillo at Chichen Itza is another example. Most temples were set up with such windows that the sun, moon and other significant bodies in the skies could be viewed at important occasions of the year. Mayans were an agrarian society where the survival of the community depended on its being closely knit together. In this structure, religion and priests played a critical role. Temples served as the congregational ground for various ceremonies, rituals, festivals and even political events. It was in front of the temples that the masses gathered to witness different sacrifices, watch the priests perform rituals and hear the priest-king make any proclamations. Even festivals including religious music and dances often took place in the courtyard of these temples. The temples were tied to the education of the masses because priests were the educated elite of the Mayan society. Sciences such as astronomy, hieroglyphs, medicine and others were often confined to the hands of the priests. Mayan temples are some of the most remarkable of constructions in Mesoamerican history. A huge number of these temples survive to this day, scattered around the ruins of notable Mayan cities. The typical shape of the Mayan temples was pyramidic, often topped with a shrine. The staircases were built on two or four sides of the temples and lead to the top where sacrificial rituals were performed. The longevity of the temple structures owes in large part to the stone masonry and the use of lime in their construction. Astronomy was very crucial in determining the overall position, architecture and shape of the temple. Mayan priests also used the temples as observatories for sun, moon and the planets. At times, special windows were constructed in temples to allow the observation of these bodies at specific times of the year.